Deliberate invention, aimed at starting a biopharma business, can be a valid, creative, and sometimes rewarding enterprise. Many or perhaps most of the companies in this space begin as a scientific concept looking for a medical application. But examples of the opposite model — gathering appropriate expertise around the table to identify and select a scientific target for a new business — could be rare. In the case of Apellis, the way less traveled began with a relatively safe sendoff. The company was born from the winning entry of the 2001 Harvard Business School Business Plan Competition, but then only as a concept, called Potentia Pharmaceuticals. Although the plan envisioned therapeutic applications involving nanobiotechnology to support the then popular approach of high-throughput screening (HTS), the underlying science and technology were then nonexistent. Francois was originally a physician in Belgium, who in 1999 wound up at the University of Louisville in Kentucky, where he would complete his Ph.D. fellowship in physiology with a heavy emphasis on immunology. There he worked on the research side of the team that did the first successful hand transplant in the United States. He also became involved with the Harvard students who would be his teammates in the business plan competition, some of them cofounders of Protentia. “We had to decide on how to modify macrophage behavior, which is what we believed and continue to believe was important in AMD. We decided that inhibiting Complement Factor C3 was one novel way to do that,” he says. Pause for a short biology lesson. Complement Factor C3 is a key part of the complement system, the chief mechanism of the innate immune system. Innate immunity is a nonspecific response to anything the body cannot recognize as native to itself. In a process called opsonization, the complement system mostly helps immune cells target and destroy “foreign” bodies, substances, and tissues by installing unique molecular tags on their surfaces. Multiple complement factors form in a hierarchal cascade involving three pathways, all of which converge on the cleavage of C3, the pivotal point in the cascade where all the effects of complement activation originate. Because C3, with its fragments C3a and C3b, is pivotal to all three pathways, Francois and his team believed blocking C3 could treat chronic autoimmune diseases by effectively inhibiting the entire complement system. The team found a class of compounds, the compstatin derivatives, that were already known to inhibit complement C3, and they soon licensed the relevant compounds from the University of Pennsylvania. 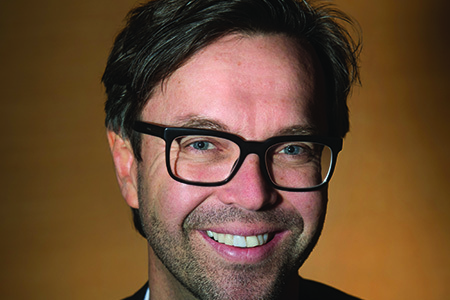 Francois says, “We moved forward very aggressively, some may justifiably say ‘naively,’ into developing these first drug compounds in patients with age-related macular degeneration.” In 2005, in one of the first breakthroughs by human genome projects, researchers discovered an association between AMD and a mutation in the genes related to the complement pathway. Decades of drug discovery and development by other companies had tried and failed to cure or modify AMD at its root cause. Potentia (now Apellis) seemed to have an approach that avoided the typical dead end and perhaps could address the cause of the disease effectively. The company moved its lead compound, POT- 4, a synthetic cyclic peptide that binds specifically to C3 and C3b, effectively blocking all three pathways of complement activation, into Phase 1 clinical testing in 2007. Eye-care giant Alcon then decided to enter into a licensing agreement in combination with an option to buy Potentia in 2009. In 2011, however, the arrangement was subject to unforeseen disruption when Alcon was acquired by Novartis. “The governance of molecules became a bit of an issue between NIBR (Novartis Institutes for BioMedical Research) and Alcon, and we found ourselves in the middle of that quagmire,” Francois recalls. Still, while all of that was happening, Apellis Pharmaceuticals was founded, and its first order of business was to modify the compstatin- derived molecules for subcutaneous injection. Subcutaneous delivery was key because the company saw an opportunity for systemic inhibition of C3, which others had feared to try with such a powerful and ubiquitous immune modulator. Apellis developed APL-2, which consists of two POT-4 moieties conjugated to a polyethylene glycol (PEG) polymer, for subcutaneous injection with the lead, proof-of-concept indication, paroxysmal nocturnal hemoglobinuria (PNH), an ultra- rare blood condition. The formulation is also a relatively stable liquid, which makes it possible to provide another benefit to patients — they can inject themselves at home rather than in the doctor’s office. At present, the injection regimen is twice weekly. People with PNH have a mutation in the bone marrow, often associated with aplastic anemia. The mutated bone marrow cells produce defective red blood cells that are not well protected against normal complement activation. Consequently, immune cells find and destroy these defective red blood cells, and the patients languish in the symptoms of anemia as their cell and hemoglobin counts plummet. Normally, C3 proteins constantly bombard all the cells in a body, but the normal healthy cells can inactivate the proteins and prevent their amplification to a level that would attract an immune response. In PNH, however, red blood cells lose the ability to prevent C3 amplification, and the complement cascade then pushes toward the C5 stage, which initiates the “membrane attack complex” that punctures and explodes the cells. Soliris blocks the production of C5, the last stage of the complement cascade, but it does not prevent the accumulation of C3 on the cells’ surface, leaving them vulnerable to attack by macrophages and absorption by the liver and spleen. According to Francois, about 70 percent of patients on Soliris remain anemic, and about 25 percent are severely anemic with hemoglobin levels below 10 g/dl (grams per deciliter); 30 to 40 percent also depend on periodic transfusions. By targeting C3, APL-2 aims to stop the complement cascade right where all of its pathways converge. In PNH, it would not only curtail the C5-induced membrane attack complex targeted by Soliris but also ill effects of the upstream complements such as extravascular hemolysis. Apellis is now in a transition with APL-2 from an ongoing Phase 1b trial directly to a Phase 3 trial in PNH. It is recruiting patients for the Phase 3 trial, a process made especially complicated, somewhat paradoxically, because of the small number of patients to be recruited. The trial will have a total of only about 70 patients, with a special trial design to ensure all patients remain on drug treatment at all times. The Phase 3 trial will have two arms, each containing about 35 patients with hemoglobin counts below 10.5 g/dl. After one month, patients will then be split into two groups, one on Soliris monotherapy and the other on APL-2 monotherapy, for a comprehensive head-to-head evaluation of hemoglobin and other hemotological parameters at the end of four months. Francois estimates that at least 1,000 PNH patients in the United States will fit the profile for participation in the trial. All of the subjects will already be on Soliris when the trial starts and, during the first month, will take both Soliris and APL-2. Patients whose hemoglobin counts improve to normal levels in that time can then choose to either stay on both drugs or stop taking Soliris and remain on APL-2 alone for the remainder of the trial. The company expects about 40 percent of patients who have a choice will select the APL-2 monotherapy option, if only because they will no longer be transfusion-dependent. "We moved forward very aggressively, some may justifiably say ‘naively,’ into developing these first drug compounds." 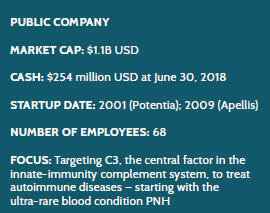 Because the complement system, with C3 at its confluence, plays a central role in many autoimmune diseases, Apellis sees a multitude of opportunities for its C3-targeting drug. All of the publicly listed clinical trials are with APL-2. Close behind the PNH trial in the pipeline is a continued emphasis on the eye, returning the molecule to in-the-eye administration with intravitreal injection. A Phase 3 trial in treating geographic atrophy, an advanced form of dry AMD, is set to begin in the second half of 2018, and a Phase 2 trial in wet AMD is ongoing. Also ongoing, but in other areas, are Phase 2 trials in autoimmune hemolytic anemia and complement-dependent nephropathies. The FDA has granted Fast-Track Status to both the PNH and geographic atrophy programs. In particular, Apellis is focusing on four potential indications among the complement-dependent nephropathies. Two of them, IgA nephropathy and C3 glomerulopathy, composing a smaller and more pediatric- oriented segment, not only result typically in loss of kidneys but also attack transplanted kidneys. Two others, and potentially much bigger indications, in the area are membranous nephropathy and lupus nephritis. The return to AMD indications also reflects a major milestone in the company’s development. In January 2014, Apellis succeeded in transferring all original rights from the Potentia shell to the new company, including all of its work on the eye. “All of a sudden we were back in the act,” says Francois. The company quickly decided to take its lead drug, APL-2, then a subcutaneous product, reformulate it as an intraocular injection, and target it at the advanced dry form of macular degeneration. The strategy deliberately bypassed the much better known wet form of AMD, which already has available therapies such as Eylea, Lucentis, and Avastin — all of which treat blood-vessel leakage in the back of the eye but not the underlying inflammatory disease. Francois explains: “What happens in macular degeneration is the retina slowly but gradually perishes and is phagocytosed, quite similarly to red blood cells in PNH, by tissue-resident microphages and microglea. Ultimately, over the course of a couple of years, that leads to blindness. There is no drug on the market that can slow down that process, and everything in drug development has failed — with the exception of the Phase 2 clinical trial in geographic atrophy [GA] that we read out in the summer of 2017.” In that trial, APL-2 slowed the loss of retinal cells in GA and met its primary endpoint of significantly reducing the growth rate of GA lesions versus placebo. Francois says the GA trial results allowed the company to do an IPO in late 2017 and to raise the financing needed to start its current Phase 3 clinical trials. “We believe we have a very good chance of replicating the Phase 2 data in Phase 3 and of being the first company to offer something to these patients to slow down a condition that leads to blindness. We will do this via a mechanism that is really fascinating, that we don’t fully understand yet, but that shares a lot of commonalities with neurodegenerative conditions, like Alzheimer’s and several others that we want to explore further and see if we can make a difference there.” Deliberate invention has now led this company into fateful exploration, as it continues to visit all of the potential uses for what it has invented.